The graduation rate for the Buffalo Public Schools held steady for a third straight year, with almost two-thirds of the Class of 2018 graduating on time. The school district did see gains, however, when it came to improving the graduation rates for students with disabilities, as well as those learning English as a new language. At the same time, there’s still a wide gap in the district between the percentage of white students graduating compared to their black and Hispanic peers. Those are just a few of the highlights from data released Wednesday by the State Education Department, which showed that 64.5 percent of students districtwide earned their diplomas on time last year, including those who graduated in August. The rate was 63.8 percent for each of the graduating classes of 2016 and 2017. Buffalo’s graduation rate was as low as 48 percent in 2012. After taking over nearly four years ago, Superintendent Kriner Cash set a goal of a 70 percent graduation rate for the 2019 class. He acknowledged Wednesday that reaching 70 percent may take the district a little longer than anticipated, but he was still encouraged. “The data is not surprising to me,” Cash said. “It’s very difficult to move the graduation needle in a large, complex urban district four or five points at a time." The graduation figures for 2018 come two weeks after the release of another set of state data, which showed 36 of 50 schools in the district are now considered in “good standing” with New York State. 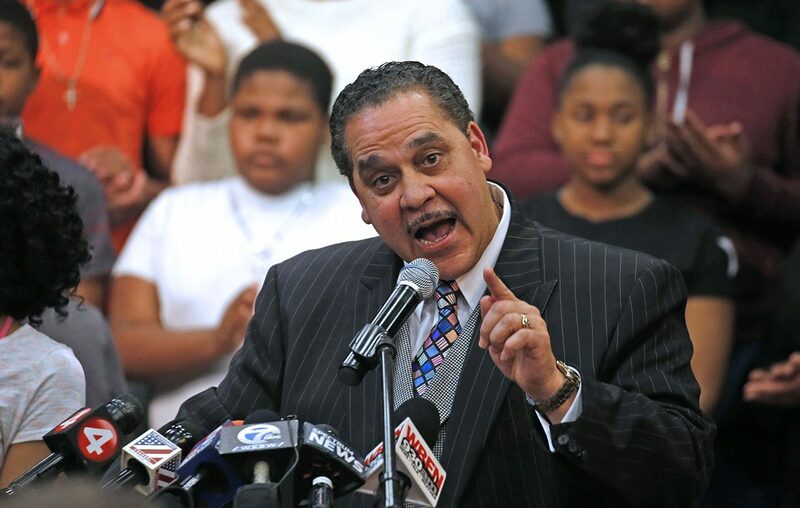 That data also showed that the number of Buffalo schools under the threat of an outside takeover has dropped from 25 three years ago to three for the next school year. In fact, it led Cash to proclaim that the school district has “turned around,” and he didn’t back away from that on Wednesday. Statewide, 82.6 percent of the Class of 2018 finished high school on time, continuing a steady rise in rates over the last decade, the data showed. Last year’s cohort – which numbered 210,602 across the state – represented the largest since 2005. In other upstate cities, Rochester saw an increase in its graduation rate, while Syracuse saw a decline, although both had four-year graduation rates lower than Buffalo. In Buffalo, seven of the city’s high schools had graduation rates of 80 percent or higher. They were: City Honors, Olmsted, Performing Arts, Hutch-Tech, da Vinci, Emerson and Middle Early College. Meanwhile, four high schools – Burgard, Math Science Technology, Newcomer Academy and Academy School 131 @ 4, an alternative high school – had graduation rates below 50 percent. The graduation rates for East, McKinley, I-Prep and South Park fell somewhere in between. One of the points of concern was the persistent achievement gap between white students and their black and Hispanic peers. While the gap has been narrowing slightly across the state, Buffalo is still seeing a wide gap – 75 percent of whites graduated last year, compared 60 percent of blacks and 50 percent of Hispanics. Genelle Morris, chief accountability officer for the Buffalo Public Schools, said the district did see an improvement in graduation rates for students with disabilities. Graduation rates for those students rose to 43.3 percent last year, up from 37.8 percent three years ago. In fact, that was the largest gain among the so-called Big 5 urban school districts in the state. The school district also saw a jump in the graduation rates for its English language learners, an issue of concern in recent years because of the growing number of immigrant students to the district. The graduation rates for Buffalo’s English language learners rose to 38.5 percent last year, up from 24.2 percent three years ago. That, too, was the biggest gain among the Big 5.